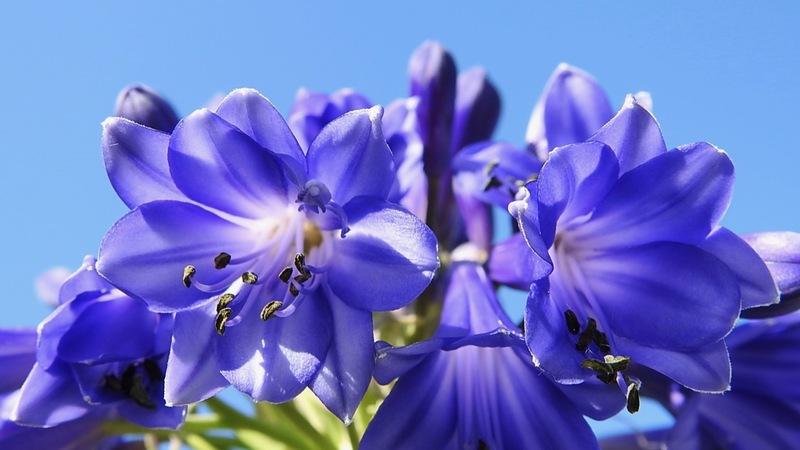 Whether this Agapanthus flower is blue or purple, I think it is perfect. Actually, I think it is perfectly gorgeous, and I’m about to have two standing tall and proud and the perfect addition to my front garden. I still have no idea what variety of Agapanthus this particular one is, but I’m hoping that when it fully opens, I will be able to make that decision. Thankfully there are hundreds of photos online I can use for a comparison, but I do need to decide what this colour is. What colour do you think it is? With all the flowers of the inflorescence still hidden inside the bracts, they certainly look purple, and for sure the photos I took with my iPhone (see What a Stunner) show a deeply saturated royal colour. These shots I took with my Nikon this morning look slightly washed out by comparison. Almost not true. But I do have to admit that, although the colour in these photos looks blue, to my naked eye the flower looks purple. I think I need to play with the setting on my camera and see if I can capture the colour correctly. My other varieties, a (true blue of some sort) and a white, are in full bloom, but I’ve also still got plenty of young plants just starting to open. I certainly love seeing all the Agapanthus in my garden and haven’t the heart to cut them and put them in a vase. In Southern California where I grew up, their common name is Blue Lily of the Nile and are used extensively in landscaping. Gorgeous! They are so lovely and in bloom everywhere here at the moment. I’d call the flowers purple, they’re certainly stunning. Ours are much paler and none have opened yet. HI Clare, we’ve had a few warm days recently, a couple in the mid 30s last week so I don’t think it will be long before the buds open. I like the darker Aggies and bought some “Black Panthers” but they didn’t survive. Thank you, I think so too. Oh what beautiful flowers! And you get to see them in your garden! Lucky you! I have in the past but just can’t seem to do it this year. Maybe I’ll cut some of the young ones – maybe I won’t. Honestly, I haven’t decided just yet. Love the agapanthus in our gardens, we have both white and lavender.